It’s been a tiring day. Up at 4am with a child who had ‘finished their sleep’. I managed to convince her to go back to sleep (until 5.30am) but sadly I then just laid there, wide awake, waiting for her to get up again and for the morning to start (I used the time productively and got on with my book!). This evening could only be described as a parenting fail. Bedtime was a bit (ha!) of a disaster and she finally fell asleep (ran out of excuses?) around 8.30pm. So after a pretty exhausting day which included lots of walking in the rain, rushing and the horrors of ‘networking’ (shudder) I’m going to focus on things that have given me a little lift over the last week. 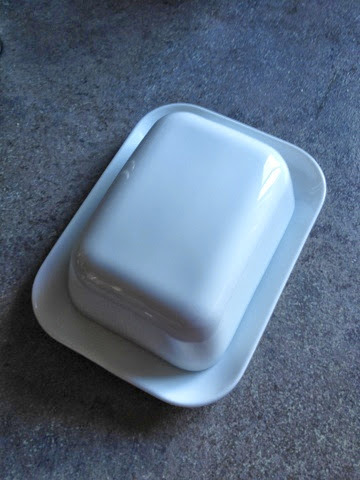 :: A new butter dish. Reduced in Waitrose I couldn’t resist it. I’ve coveted an Orla Kiely one but this one will do just as well in the interim...until my birthday. Actually can you ever have too many dishes? I could always use two butter dishes, one for unsalted and salted butter each. Easy. :: Daffodils. I’ve barely been able to walk past the flowers in the supermarket. 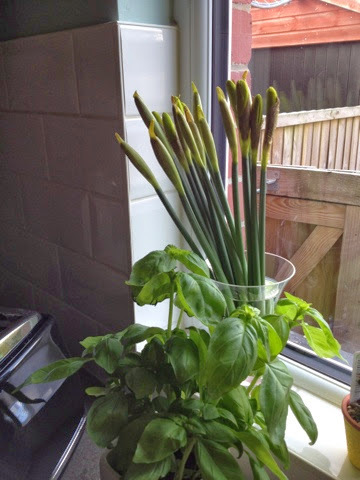 They cheer up the kitchen on a grey morning or on a sunny morning. :: Just below the daffs...the dishwasher. Also a source of immense joy (sigh). 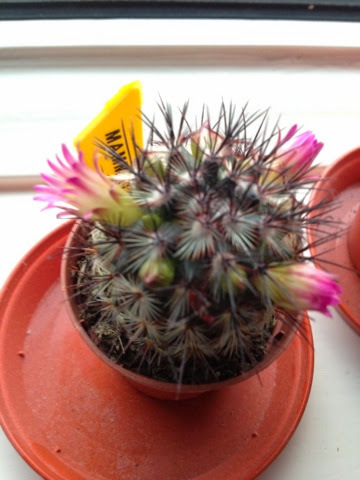 :: One of our cacti is flowering. The buds open and close through the day and are longlasting. There are at least 4 buds on this one so we’ll see if they all open. 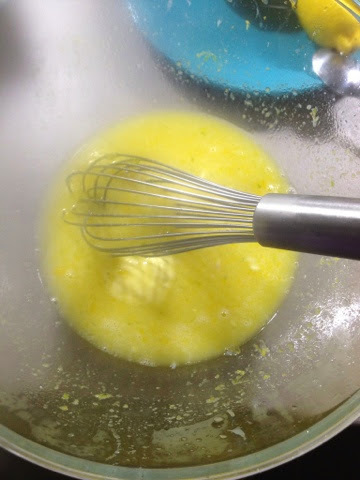 :: Lemon and lime curd – I cheated and used this recipe (halved) and the microwave. 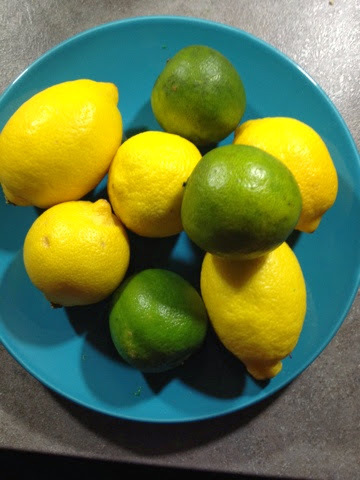 It’s zesty and sharp and delicious on plastic white bread! :: Enjoying my job. 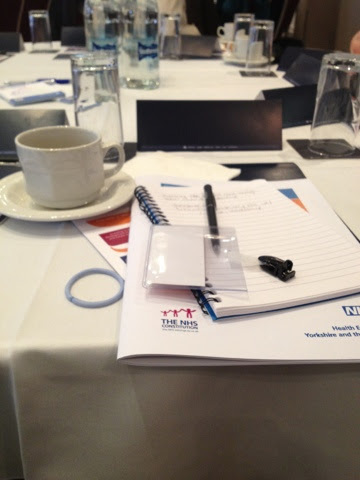 Attending a conference. I don’t like ‘networking’. I find it hard and I’m not very good at it but I do like learning and listening to inspirational people and that’s what was good today. That and the coffee at the venue. 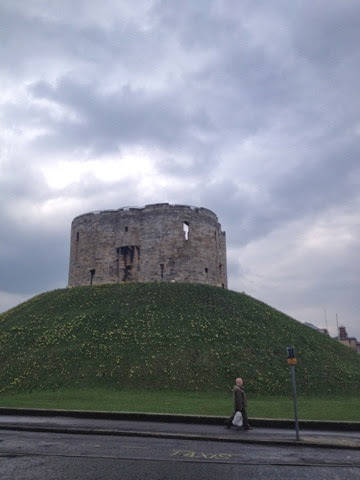 :: Walking through Leeds and York at opposite ends of the day, The weather was grey andA rainy. In fact it only seemed to rain when I needed to walk today! But it was time to think and photograph (poorly I know with my phone) ...before heading home. The library and town hall at 8am. :: Planning days out in April...including a baby shower (where we’ll have afternoon tea) and a ‘date’ (getting babysitter!!) with the ABO. :: Rev – possibly the funniest show on TV. As ever Olivia Colman is superb! PS Thank you for your tips on cooking recently, much appreciated. I think it's a great idea to make time for posts like this. I find they always make me feel better. I love your new butter dish. I've been thinking about buying a new one; I've been using a cheap plastic one from the dollar store for about 13 years! It does the job, but it could be a lot nicer. We've been taking the butter from the fridge and using it...or over melting int he microwave. I've tried the 'spreadable' butters but they seem to go almost as hard as regular butter in our fridge! I have had a few early start this past week too..... I think this post is lovely. It's importnt to remember and check ourselves - I know that more than anyone. 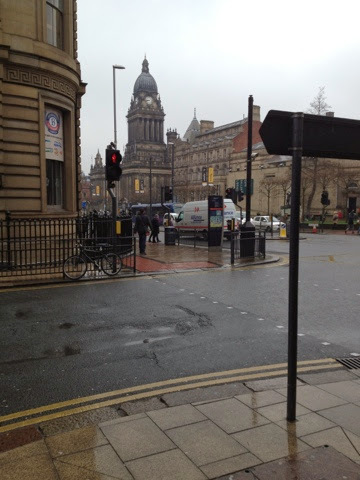 And I love the shot of Leeds City Centre. I went to Uni there in the early 90's. A time of fabulousness and I have very happy memories. Leeds is a fab place. A really good place to be a student too. I was student in Sheffield in the early 90s too...I didn't move far! A happy list, full of everyday pleasures. I've been into Leeds twice this week which is most unusual, and nice too. 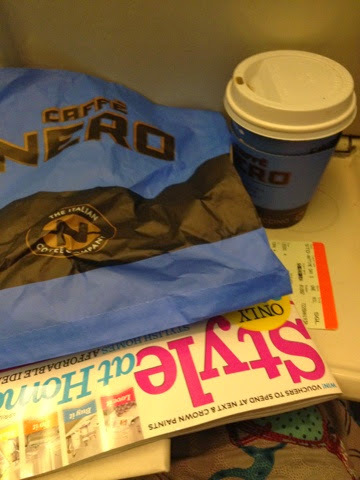 Coffee and a magazine on a train journey is not to be underestimated! Going into town (alone) is a pleasure I've not taken up since I went back to work. Maybe an hour oevr lunch spent browsing on a sunny day might be in order! !